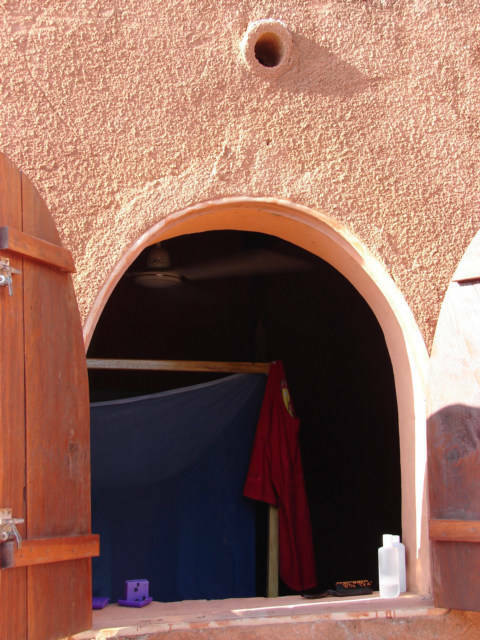 I am living in a red clay cave for 5000 CFA or 10 US Dollars. The first Hammock I have seen in Africa is here in Bobo. My Mother and Father I hope are happy, their talk too much, opens his mouth and embarrass them son has finally learned to keep his mouth shut. I am in a GREAT Hotel room in Bobo, Burkina Faso, the overall in-compared-to-other-rooms I am in a very good room. I love to read the ludicrous emails I receive on recommendations of great hotels. The person will write and tell me about this wonderful great room in some exotic country like Thailand, going into blah blah blah and then finally I learn the price of the room was 350 US dollars per night or about one years pay for the normal world. Strange as it sounds, I can find Air Conditioned rooms in Burkina Faso and most of West Africa easier than I can find fan rooms. The world is full of business travelers, people on luxury two week vacations, NGOs who are not on a budget, normally spending someone else’s money. The average person in West Africa may have never stay in a Hotel in their life; many of the girls know a room for one hour. The rooms in West Africa are designed for people who are rich compared to the average person, for example ME. I am outrageously rich compared to the average Burkina Faso person. I earn about 95 times the Average yearly wages of a Burkina Faso person, if the person next to you earned 95 times more than yourself, you would think, this person is super-rich. I am super-rich compared to the average West African person. 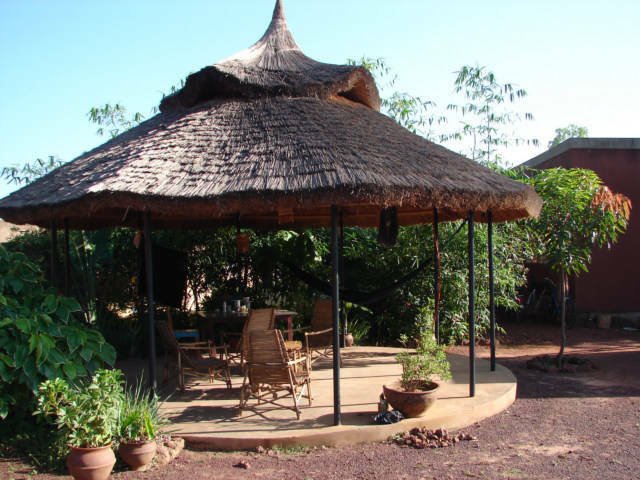 Therefore, the Hotels rooms have AC and cost 10-40 US and not 1 dollar per night or a price the Average Burkina Faso person could afford. I am in a great fan room, however my list of problems with the room makes me think Air Conditioning is the simple solution. I am living in a red clay cave. Ok, it is not a cave; I think a cave needs to be below ground level or maybe in the side of a mountain. My great room is inside the left part of this building made of clay. I am in an above ground cave, made out of red clay, with a couple of holes to so I can breath. I was wrong, not the dictionary correct word to use, it is not cold, my room was warm and humid because when I left the room, I locked it up, closed the window, when I returned to my cave it was humid. Look at small hole above window. There is this small hole at the top of the room, I hope to learn why? Why is there one small hole at the top of the room? The naturally cool room in a Hotel is on the bottom floor, and beneath a few floors of concrete, with no sunlight. The problem with room is how do you breath, a person starts to suffocate and has this real inclination to climb out of the hole and find a place with air. 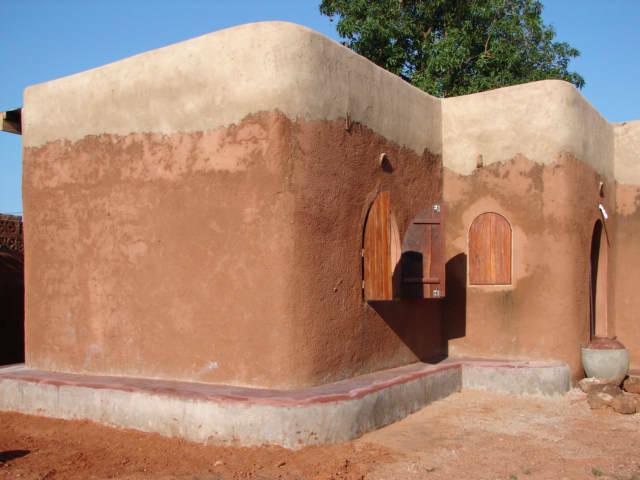 Burkina Faso people are smart, they construct home out of red clay colored dirt, and then make the ROOF of clay, and essentially, it becomes an above ground cave. There is a real danger, if one of these roof fall in on a person they can be killed. When I was in Bolgatanga, Ghana it was raining and one of the young women cooking was telling me the rain kills people, because the homes collapse and kills the occupant of the cave. My room is great, it is clean, it has a fan, I have my own private toilet and shower and there is a courtyard with hammock and chairs. I also have a kitchen to use; however, I am supposed to donate money for propane if I use the burners, price confusions because they never rent the rooms. I am sure, I am one of the few people who has rented a room and there are no clear and established prices for room benefits. - concern for people: a concern with the needs, well-being, and interests of people. This is probably a 7 on a 1-10 scale of projects, I so far think a very good project, and at least I have not seen the managers driving 4-wheel drives around. 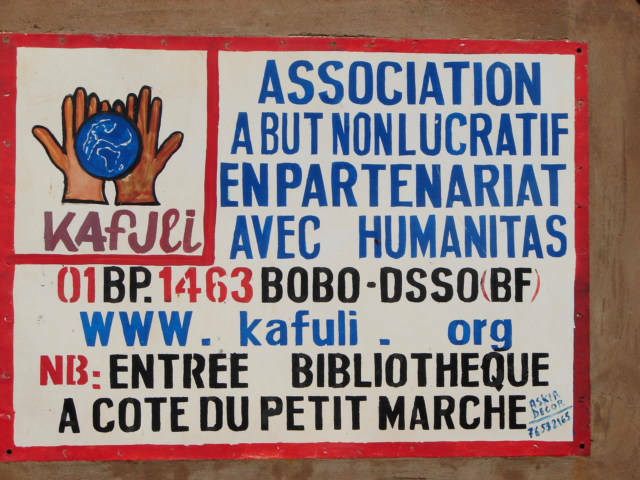 They have a library for the people to use and help with textiles, and somehow people sponsor and pay for school fees for children, everything is on the up and up and seems great. Looks like the stereotype door to a cave. This place is great, and if you leave the window and door open a reasonable good value for 5000 CFA or 10 US for a person with a car. You need a car as this is about 3 Kilometers or more from the Central Market, however cultural immersion is guaranteed. I do not have a car, so I will move to the city in a day and stop the long hoof or fights with taxi drivers. 1. Keeping the bugs and mosquitoes out of the room, because you do not have to open windows. 3. Fans that are loud, the new type of AC is quiet. 4. Having to rent a room on the bottom of a building to be cool. 5. You do not need a mosquito net. 6. Privacy because you close the windows and doors. 7. Quiet because the windows are closed. I never thought how AC is a simple solution to a hotel needing to be designed well and located in a quiet neighborhood. I am in a nice quiet neighborhood, far from the central city and a great food market is around the corner. A semi-ideal location for a person driving a four-wheel drive, and wants to park the car. More or less easy to find in a car at the end of Sector 21 before a Yellow Mosque. 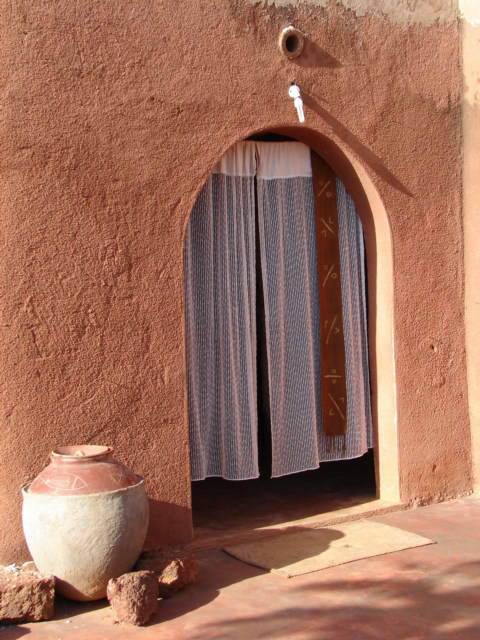 The room is typical construction methods of Burkina Faso and clean and interesting sleep in a clean version of the local Burkina Faso Architecture and building design.